Once you have successfully logged in to your account with your Panelist ID and password set by you, the following Welcome Page will be available. It will give you an overview of all important functions. You will receive 3 – 5 test letters per week on average. 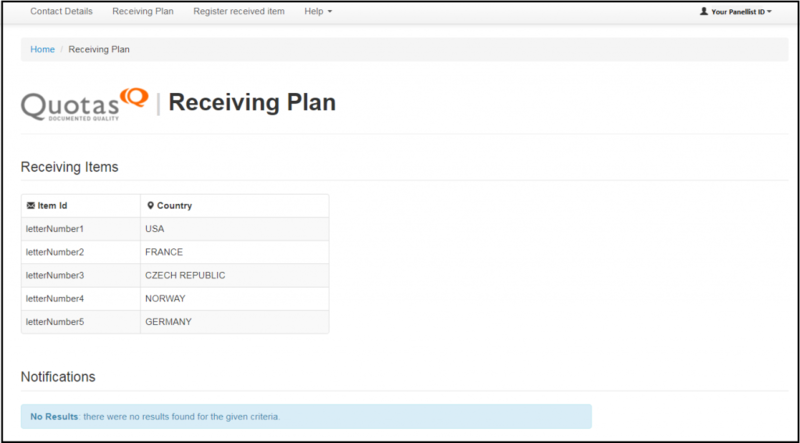 You can see the exact letter numbers and from which country they have been sent in your online account under ‘Receiving Plan’. For the correctness of the collected data it is very important that you empty your mail box on a daily basis in the evening. Furthermore, it is essential that you enter the data the same day as you receive the items. Please make sure to always note down the receipt date and weekday on the item envelope when you empty your mail box. Additionally, please keep all test letters (including thick envelopes and small boxes) for three months. Within the retention period of three months and in individual cases we may ask you questions concerning a specific test letter. Please note that you only have to archive the envelopes, boxes and test letter documents – it is not necessary to keep any other content. We recommend you to unfold the boxes to save some space. The test letters are of four different formats – small and big letters, thick envelopes and small boxes. In case you are not present during the delivery of a thick envelope or a small box, your postal service provider will notify you about the delivery attempt. Normally, you will receive this notification in the form of a paper card in your mail box. If you have a special agreement with your postal service provider, you may also be informed by SMS or e-mail. When you receive a notification, please do always take a picture, in case it is for a test item. 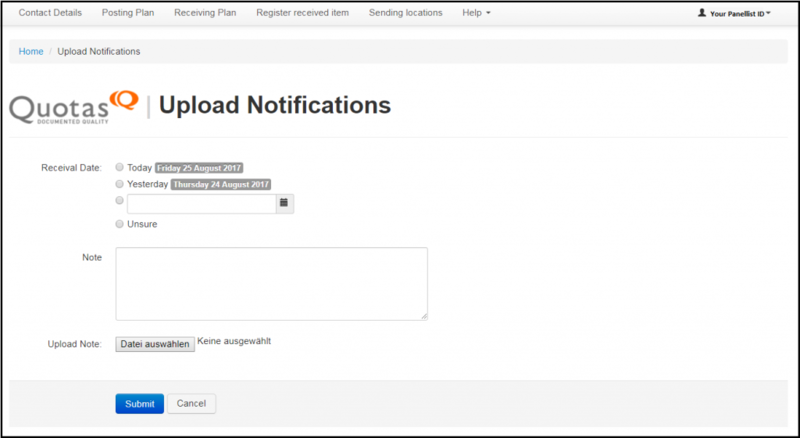 If the notification was for a test item, please upload the notification BEFORE registering the received item. Please click on ‘Upload Notification’. Select the date when you received the notification. If you cannot remember when you received the notification, please click on ‘Unsure’. Use the text box to write down the number of the corresponding test items and if needed a comment to an unusual event. To upload the picture of the notification, please click on ‘Search’ (this button may be in your local language, depending on your browser settings), select the photo of the respective notification and upload it. The photo will appear. If it is the right one click ‘Submit’. Please do remember that the notification details do not suffice; the test items still need to be collected and the details must be entered online. After you have received the test items (with or without notifications), please confirm the receipt date (resp. the date you have collected the item) in your online account. Please click on ‘Register Received Item’, enter the Control ID / Identification Code which you can find on the document inside the test item and click on ‘Search’. Now please enter the correct receipt date. If you cannot remember the exact receipt date, please click ‘unsure’. 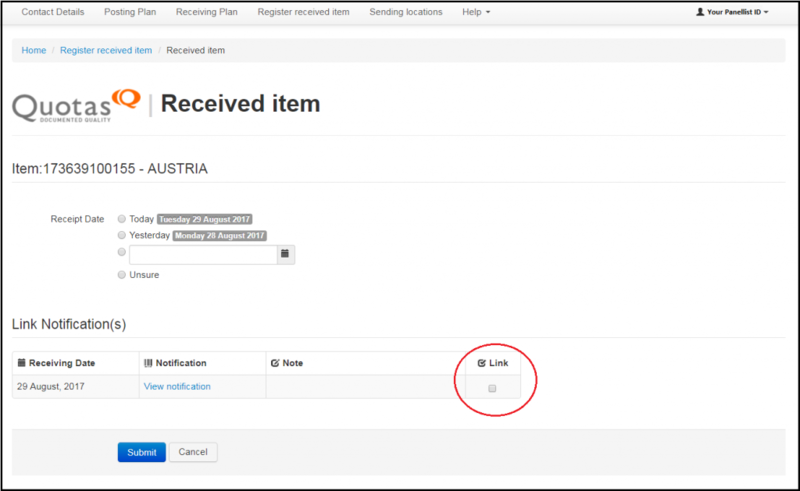 If you have received a notification for the respective item, please link the notification with the item by ticking the corresponding box (circled in red in the picture). 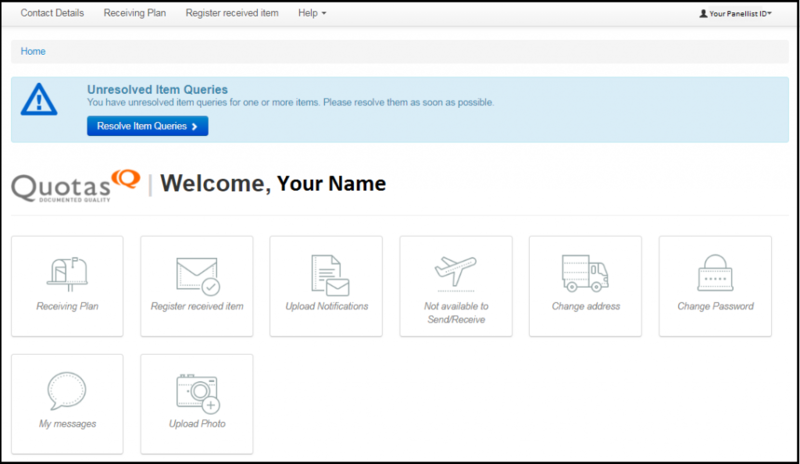 When confirming the receipt of the thick envelopes and small parcels (bulky items) online you have to select the delivery place by clicking one of the options given online. Please read the following explanations, as some of the options can be misunderstood easily. Please make sure to always choose the correct delivery option for the small packets and big envelopes. Only when you enter the notification BEFORE you enter the Control ID, the system will allow you to match the test packet with the notification. This way we receive the exact date when you actually received the notification and the date when you actually picked up the packet. In case you receive a damaged item, please inform us by email/message and upload or mail us a photo of that item – after entering the receipt date online as usual. You will receive test letters with either passive or active transponder types (only one type for each participant). 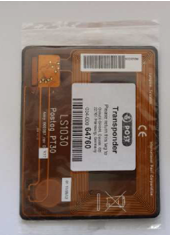 If you will receive active transponders (please see picture above), please make sure to return these to our production unit by simply using the return envelopes provided by us. Please insert two transponders (if you have only one, please wait up to one week for a second to arrive) into a return envelope. Please note that no franking of these envelopes is needed, as they are already Pre Paid. Please simply drop the envelopes into a mailbox one day after the receipt of the second transponder (up to one week). Passive transponders do not have to be returned. Ideally you are available during the complete duration of the survey or you can delegate the task to another person in the case of absence or illness. Please inform us immediately about any duration when you won’t be able to send test items (e.g. change of address, absence, holidays, …). Please click on the button ‘Not Available to Send/Receive’ and thereupon on ‘+Add’. Now fill in the start and end date and the reason. If you have a cover who can do the tasks when you are not able to, please select the box ‘Covered by someone else’. A cover helps us to meet our target of receiving a certain number of test items from your postcode area during the year in order to make our findings statistically valid. Anyone who is over the age of 18 can cover you as long as they can perform the tasks exactly as you do: empty the mail box every day and enter data online. A family member, your house mate or neighbor, or someone who will feed your cat, for example, may cover you. Please instruct them in detail and make sure they understand how to carry out your UNEX tasks before you go. If you do not have a cover, please make sure to inform us about your absence at least six weeks in advance. In this way we can adjust the production of test letters and you will not receive any test mail when you are away. The section ‘Person who will cover me’ opens. Please fill in the required information – Name, Phone Number and Email – and click on ‘Save’. 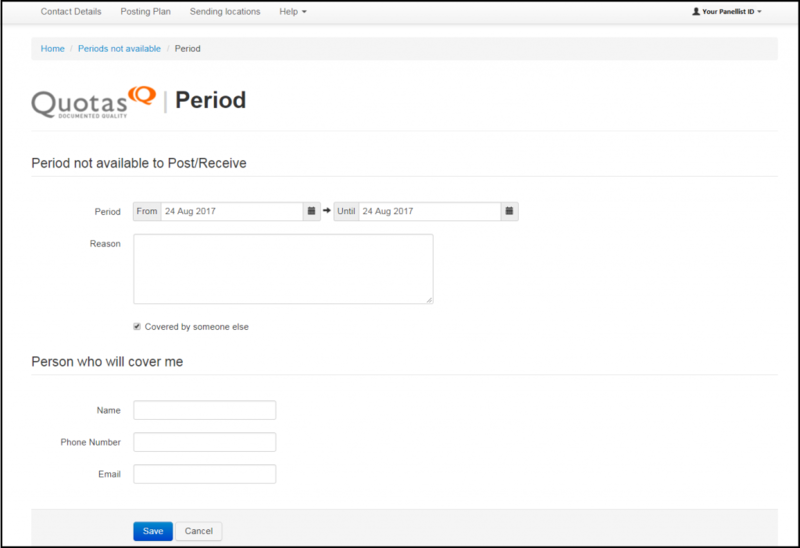 If you wish to add another period where you are not able to send, simply repeat the above mentioned procedure. If the system tracks any irregularities in the data you entered, an item query will be raised. When you login to your panel zone, you will see a blue box. Please read the text carefully and click on ‘Resolve Item Queries’. Now you will see which item is queried. Next, please click on ‘Resolve Query’. Please read the information on the screen carefully and check if the data you had entered is correct. If it is not correct, please change it. Then click on ‘Save’. If you are unsure, please click on ‘I don’t know anymore’. If you are moving, please let us know at least six weeks in advance, so that we don’t continue sending test items to your old address. It is easy to let us know, just click on ‘Change address’ and choose if you stay within the same country or if you move abroad. If you move abroad, you will then need to contact us directly. If you stay within the same country, please follow the next steps. Enter the date when the new address will be valid and your new postcode and click ‘Next’. 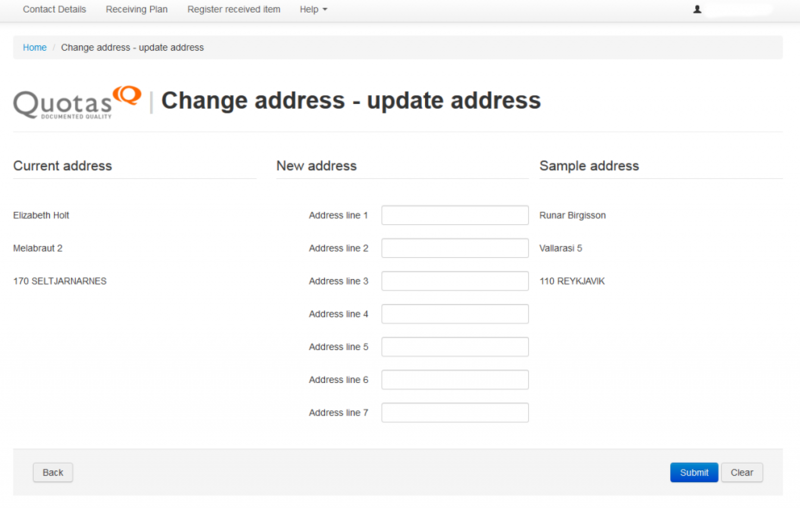 Please enter your new address according to the sample address on the right and click ‘Submit’. It is not necessary to enter the country name. Please check if your new address has been entered correctly. If so, please click on ‘Confirm’ Otherwise, please click ‘Back’ and correct the new address. Please note: If you have redirected your mail from your old address, please enter all redirected test items as ‘unsure’ as the redirection normally delays the delivery process. Of course we do not want to lose you as a participant in our survey. However, in case you need to end your participation, please inform us at least four weeks in advance. All test letters need to be produced several weeks before the actual planned send date. Therefore, we kindly ask you to receive those remaining letters and enter the data online. Should you have any additional questions, have a look at our Help Section or check our FAQ section at http://quotas.de/en/unex-questions-and-answers/. You may also simply contact us via ‘My Messages’. ‘My Messages’ is a communication tool to get in touch with the panel management if you have any questions. 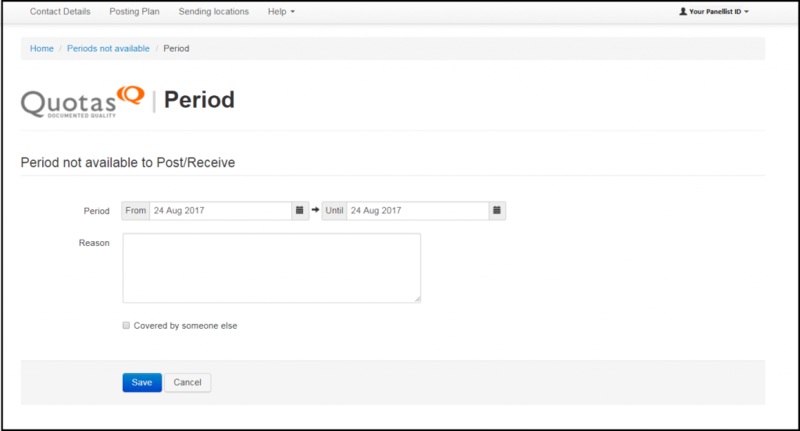 In order to contact us via message, simply click on this feature and type a message. Once completed, please click on ‘SEND’. Any new messages in your inbox, i.e. a reply from us, will be indicated by flashing of this feature and a number – of new messages – in the right upper corner of the ‘My Messages’ feature. You can also get hold of us by sending an email to unex-panel@quotas.de. We are more than happy to help! When contacting us via email, please make sure to indicate your country and your Panelist ID within the subject of the email. In this way your request or query can be solved and replied to more promptly. Now you are ready to start participating in our postal survey!